Summer holidays is the time when the house is gradually filling up with more and more sand / dog hair / grass clippings / beach towels / chalk dust; and the person who's usually cleaning it cares less and less about cleaning it. When the kids go back to school (ie, 2019), I might get the house properly cleaned, but at this point, I don't see much point. They're just gonna keep traipsing in sand / grass clippings / chalk dust and hanging beach towels at the most random places. Heck, it's a good day when people's pyjamas don't spend the entire day on the sofa in the living room! In my car, underside of booster seats has, like, a whole plethora of broken crackers, glitter and random sh*t kids bring inside the car, and I refuse to clean it until this summer holiday is over. No way, Jose! But everyone's fed and watered and everyone's alive, so I'd say, I'm cool bananas. Kids probably think it's a good summer. I do, too, except at 6-something in the morning when my daughter, yet again, thinks the day has started and everyone should be up again, so off we go again. To me, the highlight of Shania Twain's concert, I have to admit, was when she called a couple of people from the audience up on the stage. First were a young couple, probably in their early 20's. The girl was giddy (!) with excitement: she squealed, hugged Shania, squealed again, hugged. "What's your name?" asked Shania. - "Sam!" answered the girl. The girl laughed, almost hysterically, and through laughter pressed out the answer: "Temuka!" The audience laughed. And cheered. It's an insider's New Zealand humour, I think, that Temuka is the sort of a place that people make fun of, at least on the South Island. This girl must have been very aware of it, because she kept laughing alongside the audience. Shania then turned towards the man. Name? Profession? "Sheep shepherd!" answered the man. Oh man how the audience cheered! By that point even Shania started cheering, remarking how 'New Zealand' this was, to get the couple up on the stage, and they are from Temuka and he's a sheep shepherd. "So," Shania continued, "What's your story? Are you guys married? Boyfriend / girlfriend?" She held the microphone up to the couple. You should've heard the audience at that moment. Forsyth Barr stadium erupted in laughter, and that coupled laughed in the middle of it all. Then the man's phone rang. "Who's that?" Shania asked him. - "Oooh, can I answer?" Shania reached her hand towards his phone. He handed it over to her, somewhat uncertain. "Hello!" Shania beamed into his phone, "Who's that?" What I mean to say is, the concert was nice, yes, but those 2 minutes of two young people from Temuka - and the way the made the entire stadium laugh - topped it all for me. To mark the end of a school year, the primary school was giving out awards and acknowledgements: participation in the arts, excellence in attitude, sports, perseverance, school contribution etc. For the 'big' awards, there were only 1 or 2 recipients each: 1 from junior grades, 1 from senior grades; or a single awardee overall; chosen by the committee of teachers. It remains to be seen if the trend will continue, but by focusing on children's relationships and communication skills this year through the implementation of Kiva anti-bullying programme, the school has seen an uplift in science results. As in, you focus on the mental health of kids and the strength of relationships people have, and they start doing better in maths although they are not doing more maths. Oh, I think I've forgotten to mention: my dog eats flies. Amongst everything else she eats :D.
Whenever I take out a fly swat, she gets excited. "Oooooohhh, a meal!" she thinks, wagging her tail and waiting, impatiently, for the fly to hit the ground, so she can scoop it up in one big lick, and then nod towards me gratefully, as if to say, "See? Done. Next!" You're a Labrador Retriever, you are, alright. PS. My husband would like me to add: she also eats toenails. If she's in the room when someone's clipping nails, she'll stand by and wait for each clipping to fall down, so she can swallow it, and then wait for more. It's been such a long time since I've gone for a multi-day tramp in the mountains that I had to... google what food to take with me. I, literally, did not remember what food I used to take with me when I've gone hiking in the past. AND THEN I, SUDDENLY, REMEMBERED. A couple of weeks ago I had my last day of work. As a parting gift, my boss had given me a $100 gift card to use at a department store. I had wondered what I would buy from a department store given that I'm not, really, a department-store-of-a-girl - almost everything there costs more than it does anywhere else, so it seems like a waste of money to buy things for $x, if other places sell the same for $x-15. But then it suddenly occurred to me: they have an outdoor department there. And in the outdoor department, they sell camping gear. And amongst camping gear, they sell freeze-dried camping meals. Now, don't get me wrong: I'm not opposed to camping meals as such. They can be exceptionally (!) tasty and light to carry. (In fact, in Svalbard it was a highlight of my week to eat ready-meal beef stroganoff on sled dog trips.) But camping meals are expensive, relatively speaking: standard meals are between $13-$16, depending on what brand to buy. Although packets usually say "serves 2" I don't ever remember having to share my portion with another person, so I kind of assume that $13-$16 is a price of a single serving. Across a 5-day trip that's... $65-$80 for dinners alone, plus breakfasts and lunches, so let's just put it this way: I have not, personally, bought camping meals before. I have gladly eaten them :D on trips where they've been provided to me, whether through work or on tourism trips, but I have not voluntarily paid for them. Remembering that I had a $100 gift card to a department store, which my boss urged me to use to "treat myself", I suddenly had a brilliant idea to spend that money on a whole array of freeze-dried camping meals (I even got grated cheese! I love cheese!!!) and, let's just put it this way: I am f*ckin' looking forward to that trip! I know that Back Country Cuisine is not the best brand to buy, culinarily-speaking, but... heck, to have 5 days worth of dinners weighing a total of 1 kg in my backpack, man!, I can live with that. Still haven't got exact dates sorted, because it depends on when my friend gets time off work, but the plan is to head to Gillespie Pass for 4-5 days in early January. A friend's friend is working as a hut warden at Young hut, so we might take an extra 'lounging day' in Young valley, just to catch up and play Rummikub with that hut warden. Have fun, basically! Talking of fun: I spent a good hour on a climbing wall yesterday. I had probably not done that in... I don't know, 9 years? The process was everything but graceful, and I bashed up my knees working up an overhanging ledge. (Can't get feet over an overhang? No problem! Put your knee on the wall instead - in fact, put BOTH knees on the wall! And then stay there for a moment, kneeling on an upper part of an overhang, trying to figure out what the heck you're going to do next, and scrape the skin off your knees when you finally move. Trust me, it's awesome. Awesome!) (Okay, in case anyone's confused: it was sarcasm. There was nothing awesome about getting up an overhang in such a way, except the joy of getting up somehow which, to me, was enough yesterday.) I came away feeling entirely wasted and could hardly turn a handle on the bathroom door afterwards, but it was so, so awesome to finally do stuff. So awesome! This year I've turned 34. And I think I am finally starting to understand the importance of art and creativity in fostering empathy in people; and why children should have time to pick up a paintbrush, or do woodwork, or sewing or whatever, not just in primary school but throughout high school and into their adulthood. There's a balance to be struck between sciences, art, sports and games. Time to just be, not with homework, but just be and choose whatever it is that someone's heart/brain/spirit fancies, and then do that. Oh, the pursuit of balance - they keyword of my life at the moment. I feel like for the last 2-3 years, I've been doing just that, seeking balance. How hard it can be at times, and how easy at other times. It all depends, doesn't it. On another, unrelated note: I was speaking to a friend the other day - let's call her Heather for the purpose of this story - and she said how casually provincial New Zealand still treats personal information. She grew up in Auckland, so she has spent most of her life in an urban environment, and she does not take her identity for granted. But now having moved to Invercargill, she will visit a medical centre and a receptionist will shout across the medical centre: "HEATHER MEYER!" Heather will stand up and the receptionist goes, "STILL AT 34 GRAHAM STREET???" Heather nods, pulling a face towards the receptionist, "Sorry, can you please not shout my address across the room, please?" The receptionist looks puzzled, "WE'RE JUST CONFIRMING THAT YOU HAVEN'T MOVED." - "Yes, I know, but can you please, you know... do it more discreetly maybe?" Then, after the medical appointment, another receptionist at the desk booms across the room, "YOUR CELL PHONE NUMBER IS STILL 021 569...?" - "Shhh!" Heather interrupts her, "Can you please not...? Look, here," she scribbles her number on a piece of paper, "that's my number here." The receptionist looks as puzzled as the first, and apologises. But Heather says, look, that's like this pretty much everywhere. Pharmacies, car repair, library, whatever. Just sitting in a waiting room of a medical centre she could amass a whole array of people's names and where they live, maybe even their phone numbers if she were quick enough at transcribing. It's just not... caught up yet. The old way of living, the provincial New Zealand. It is such a long slog. Take windows, for example: each window takes about 3 hours to strip of paint. I scrape out old putty, sand it down, clean. Then comes the first layer of paint: white primer. Once it's dried, I apply new window putty. Depending on window, it may take me 10 minutes, but it may also take me 1+ hour if most of the putty needs re-applying, like today. I'm not a professional joiner, so I'm slow at it. I then scrape back paint edges, and "cut in" with a small paintbrush of blue paint to create a seemingly straight line where windows and walls meet - which, of course, is never straight because the house is covered in roughcast plaster. It's satisfying, but tedious. Window putty needs at least 2 weeks to dry before it can be painted over. Then "real" painting starts: the color that will eventually be visible to everyone that looks at this house (on windows it's Valspar Tears, an off-white with a very mild tint of grey). Once dry, I add another layer if necessary. Inside window framing where timber joinery meets once a window is shut, can never be painted in one go because paint would "stick" when I close the window, so I paint them in four go's: once on wall framing with primer, let it dry. Then window framing with primer, let it dry. Then wall framing again with "real" enamel paint, let it dry. Then window framing, let dry. Then plastic seals, of course, to keep the drafts out. Basically, I do not want to sound ungrateful - because I am, grateful! - but it takes a long, long time to work my way around this house. It's old and hasn't been maintained very well. Windows cannot be "just painted", because they have to be stripped back all the way down first. Rafter ends cannot be "just painted" because they have to be washed and scraped first, and then primed, painted, painted. Once it is done it will probably never be such a long slog again, because the house will be maintained - but this year, it is. The bloody dog ate the strawberries through the net that was draped over the plants. THROUGH! I mean... Heck. Okay, yeah, sure, she's a Labrador Retriever so she's always hungry but... through the netting!? Seriously!? Yesterday me and my husband sat down to watch a documentary called "Ice town" on TVNZ's On-Demand. A little into the second episode, he asked me, "Recognise any of these people?" - "No," I replied, "But I did live there over 10 years ago..."
I recognised the places though. Many of the coastal scenes were shot near the house where I lived, and I used to frequent the church late at night when no-one was in its rooms. I recognised the university hallways, the shop, had walked down the row of houses that were swept down by an avalanche in 2015. I know what it feels like to glimpse the very first rays of sunshine after a polar night and how to load a Mauser rifle. 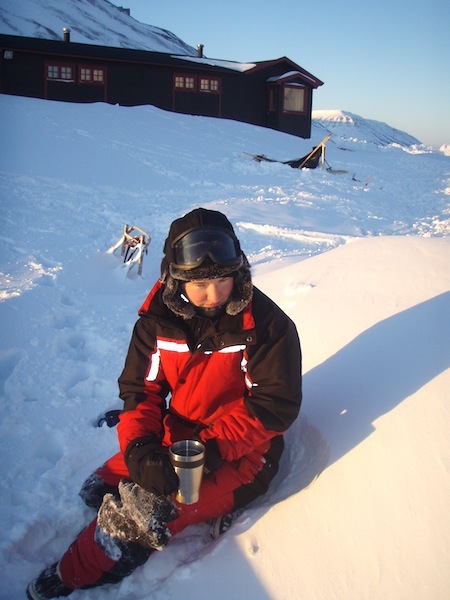 I feel privileged to have lived and worked in Svalbard for a time. A little sad that I haven't been back since but... there's other life to have had. In the June issue of National Geographic there was an interesting article about an experiment professor Dylan Selterman runs in his psychology classes at University of Maryland. Each year he gives his students an opportunity to receive free extra points on their term paper - but there's a catch. Each student can choose between receiving 2 extra points, or 6. If more than 10% of the class chooses 6 points, then NO ONE will receive ANY points; but if only a small number of people choose 6 points (less than 10% of the class) then everyone receives the points they requested - some will get 2, some will get 6. It's an experiment to illustrate how sustainability works. If each person moderates their consumption and uses only their "fair share" - 2 points - then everyone gets access to resources. The system has a bit of spare capacity, too, and it can accommodate a small number of people that are greedy - 6 points. However, if many people get greedy at the same time, the whole system collapses - and no-one gets anything. It came as a surprise to me that... in 8 years that Selterman has taught at Maryland, and used this experiment, only one class has managed to get any points at all. ONE! Let it sink in for a moment. In 8 years Selterman has taught dozens of classes. In that time, every class but one (!) has failed: even the students who have known about the experiment ahead of time, and have known that classes tend to fail due to overconsumption, have still... overconsumed and failed to get the reward, just like everyone before them. They have known that in order to receive any points they are better off staying within the 2-point limit. And yet, every year there are more than 10% of the class who think that they can get away with it, and they choose 6 points. And then they get NOTHING. No-one gets ANYTHING. It's a staggering thought to me. In recent times Selterman has added a third option: students can choose to receive 0 points. It's a self-sacrifice: the student who chooses 0 points knows that they will not get a reward either way. However, by choosing 0 points they have the possibility of "rescuing" the rest of the system. Each 0-point student cancels out the effect of one 6-point student (chosen randomly). If enough students self-sacrifice then the class has a chance of staying within the 10% limit. When it happens, all 2-pointers get their points, some 6-pointers get their points (because some of them will receive 0 points instead - due to effect of self-sacrificers) and none of the 0-pointers get any points. Selterman has found that, sometimes, that's exactly what happens. Usually it enough to have just a couple of self-sacrificers and the class stays within the 10% limit. Discussing this with my husband, we ended up having an argument over whether self-sacrificers are enabling the greedy. I said no. "The greedy are already there. They know that the system tends to collapse, they know that choosing 2 is better for the common good, but they still choose their own personal benefit over everyone else's. They choose 6 regardless! They are not "enabled" by anyone - they're just greedy. Self-sacrificers are rescuing the entire system by putting their own interests aside." My husband disagreed. He reckoned that self-sacrificers are "teaching" the greedy that they can get away with it. The greedy learn to keep being selfish because they have a low risk of being punished for they greed, and they keep choosing their personal benefit over everyone else's. We argued for a while, and never came to any shared conclusions; and simply decided to stop the argument because it became pointless continuing. What is that? A coat of arms? A kitchen tile? What? When I started pressure-washing the house prior to painting, this decorative tile emerged. It had been covered under several layers of paint, so prior to pressure-washing I didn't even realise there was anything there. But there was, of course. Remember what the house used to look like 2 years ago? There, above a bedroom window, under a beige and then another green layer of paint, well covered up. This design is now bugging me. What is that? I've tried reverse image googling, have looked at a couple of articles on 1920's brick bungalows - nothing. I can't figure out what it is. Do you know? Can you tell me, please? Is this design specific to this house, sort of like a coat-of-arms? Or is it some generic decorative tile that was added to many houses at the time? Or better yet, is it some sort of a society symbol? Was this house built by (or lived in by) some people to whom this symbol meant something?